Great location near Subi Oval, decent food but average service. 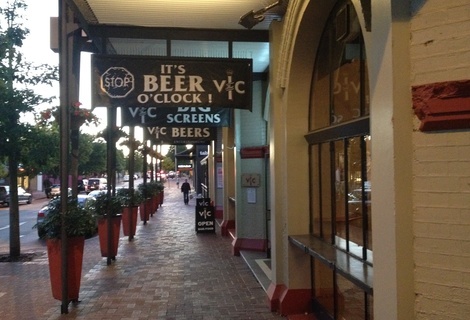 The Vic was reviewed on Monday 26th March 2012 19:30 by Richard. This wasn’t my first time visiting The Vic but it is the first time I had a meal, not dressed in my favourite footy team’s colours (I won’t say which team as it’s been an embarrassing few years) and not rushing to finish my beer before the game starts up the road. That’s is one of the best things about The Vic, it’s just up the road from Subi Oval, so it’s a great spot to have a pre/post game drink, or even a during-game (half time) drink if you’re like me and can’t stand the overpriced, barely mid strength beer they sell at the oval. Sadly it is not quite footy season yet, but we headed down to The Vic after a very long day at work for a well deserved drink and a meal. Aside from the location, the fit out/decor of the place is great too and works well for both busy Saturdays/Sundays when the footy is on as well as quieter mid week days/evenings where people generally come for a meal. We sat down at a table outside to savour the last of Perth’s bearable autumn nights. The service is nothing flash and it seemed to deteriorate throughout the night, although there were some staff that saved it from being a disaster. Our waitress seemed a bit disinterested and the bar staff weren’t much better, although one of the guys was really helpful. Quite a few things seemed to go wrong for such a relatively quiet night and the wait time for our food seemed a bit excessive for a Monday. We ordered the monthly special, a sticky ginger pork cutlet with potato gratin and vegetables. The meal deal also came with a hot chocolate pudding dessert which at $25.90 for the lot sounded like an absolute bargain. 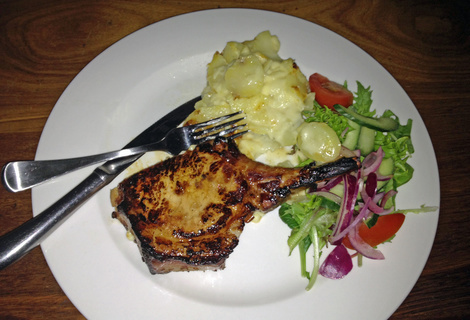 The pork was cooked to perfection and the creamy potato gratin was delicious. Ours came with a small side salad instead of veggies which was a bit disappointing but not a deal breaker. The chocolate pudding was pretty good, although it had not set properly and was a bit mushy, but still tasted quite good. Both the food and drink range was above average, with over 20 different beers on tap and a small but adequate wine list. The food options are pretty standard and you would expect to find them on most suburban pub’s menus, although there were a few outliers, like a peri peri chicken quesadilla and a beef/chicken wok. The place seemed to have a lot of potential but I got the feeling that it was just shy of being good, maybe it was the average service on the night or maybe something else. I have a theory that there is a risk of a well established pub becoming complacent, most of them would have been in business for years and may have developed a mentality of “well, we’ve come this far, we must be doing something right”. It would be a shame if this is the case with The Vic, but after all it’s just a theory and we may have caught them on a slightly below average night. Saying that I still enjoyed my time here and will definitely be back before/during/after a couple of footy matches this season, who knows, it may even be my teams year! Purchase any Pizza from our menu for only $15 from 11am to 3pm and 5pm to 9pm every Monday and why not take advantage of our free pool offer all day every Monday? Your choice of $17 schnitzels available during all food service times. Wednesday 11am to 3pm and 5pm to 9pm. 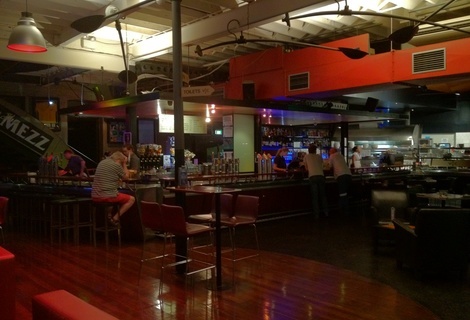 7/10Pure Bar in Subiaco, WA (285m away)Subiaco small bar – Tasty burgers a short walk from Subi Oval.